Mix materials to discover different kinds of mixtures, then focus on colloids. Discover and define differnet kinds of mixtures with the Making Mixtures activity. Optional: Look at the colloidal particles in milk under the microscope (see photo), by making a slide of a milk drop. 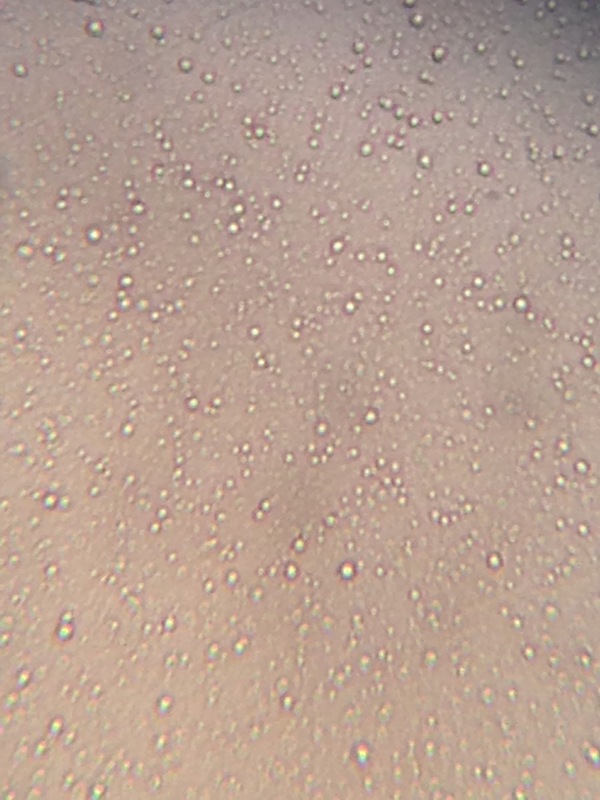 Under 100X power you can see the fat droplets, and at 400X power you can see that they are variously-sized. They are all small enough to stay in the milk, and not settle to the bottom. Then make colloids, butter is recommended as there are three colloids in its making (cream, whipped cream and butter). Alternatively, make oobleck or flubber, which are also colloids. Optional: Look at the particles in oobleck by making a slide of oobleck to look at under the microscope. Look at the edges of the material where it is thin to see the individual cornstarch particles.